Michael O'Neill will not be the next manager of Scotland, according to his assistant Jimmy Nicholl. O'Neill has taken Northern Ireland to a World Cup play-off, having steered them to the knockout phase of Euro 2016. The 48-year-old, who lives in Scotland, has been widely tipped as a possible successor to Gordon Strachan. But Nicholl said: "He's young enough, if he gets a good opportunity and a good challenge at a big club on a day-to-day basis, then he'll go." Strachan was removed from his position after falling short in the campaign to reach Russia 2018. Meanwhile, Northern Ireland face home and away games with Switzerland to try and seal a World Cup return for the first time since 1986. "He can go back in 15 years time if he wants," he said. "I spoke to him after the Norway game [Northern Ireland's final group match] and said if you manage to get us to the World Cup, you might have a decision to make. "It happened to Tommy Docherty 40-odd years ago. "He took Scotland to the the World Cup in 1974 but he didn't go because Manchester United came calling. "Now that might happen to Michael. I think that will be his next big decision, even if it doesn't happen (getting to Russia next year). Nicholl, who played for Northern Ireland at the 1982 and 1986 World Cups, has just taken on the post of assistant manager at Falkirk. 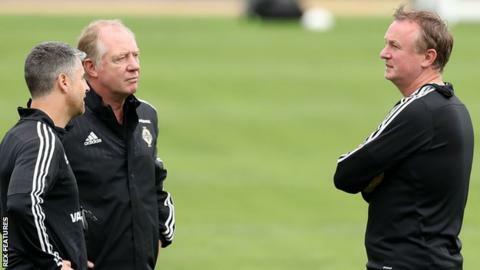 However, he will continue to work with O'Neill, who has been in charge of the national side since December 2011. "I was assistant to Billy [Bingham] when Michael was a player. If you'd asked me then if he was cut out to be a manager I'd say probably not. "But my first game in the set-up was a friendly against Scotland [in March 2015] and you could see how the players were starting to respond. "Now I see him talking to players like Steve Davis and Jonny Evans, the big hitters with big clubs in England, and that rubs off on the other players. It's how he handles players like Kyle Lafferty. "He took on a great coaching and training responsibility when Stevie Robinson left to go to Oldham [in the summer of 2016]. "It's just snowballed. It's a great time, a great atmosphere in the squad."